AMAZING GRACE, from acclaimed director, Michael Apted, tells the inspiring story of how one man’s passion and perseverance changed the world. Based on the true-life story of William Wilberforce (Ioan Gruffudd), a leader of the British abolition movement, the film chronicles his epic struggle to pass a law to end the slave trade in the late 18th century. Along the way, Wilberforce meets intense opposition from members of Parliament who feel the slave trade is tied to the stability of the British Empire. Several friends, including Wilberforce’s minister, John Newton (Albert Finney), a reformed slave ship captain who penned the beloved hymn Amazing Grace, urge him to see the cause through. Click through to the Learn section for fantastic study and discussion guides, as well as sheet music for Amazing Grace! Starring: The film stars Ioan Gruffudd (The Professor, The Madman), Albert Finney (Erin Brockovich, Big Fish), Romola Garai (Atonement), Michael Gambon (Harry Potter and the Prisoner of Azkaban), Benedict Cumberbatch (The Imitation Game, Sherlock), Rufus Sewell (The Man in the High Castle), Ciaran Hinds (Justice League) and introduces Youssou N'Dour. Release Status: Out On DVD! Click below to download the Study Guide for Amazing Grace. This study guide is a valuable tool to learn about abolitionist William Wilberforce before viewing the film. The guide targets grades 9–12 and complies with National Standards in Social Studies and other disciplines. 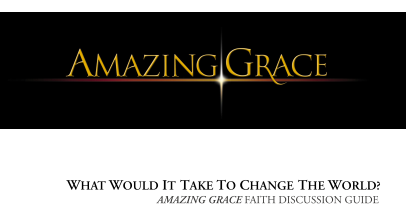 Click on the image below to download the Faith Discussion Guide for Amazing Grace. This is a valuable tool for church leaders to learn about the impact of William Wilberforce's faith, courage and compassion. It is useful for engagement and outreach with those of diverse backgrounds and paradigms, and is designed for adults, including high school and college students. Click to download the sheet music for Amazing Grace!